This exciting trip to Vietnam will allow you to travel across the country from north to south and visit the best and must-see destinations such as Hanoi, Halong Bay with an overnight stay on board the traditional junk boat, Hoi An City, Saigon, and Mekong Delta. Come and experience Vietnam like never before! For this tour, you will be provided with seven nights of accommodation in a three-star hotel. Accommodation is based on twin or double room. Higher room grade can be arranged subject to availability and additional charge and customers are advised that in some cases the selected hotels fully booked, you will be offered an alternative accommodation in a hotel of an equal category. You will fly to Hanoi. Upon arrival, the shuttle bus and guide will be holding a sign with your name and welcome you at Noi Bai International Airport (HAN), transfer to your hotel for check-in. You will have your free time for leisure or relax at the hotel and stay there for overnight. After breakfast, the guide will pick you up at the hotel at 8:00 a.m. Sightseeing today includes exploring Vietnam’s charming capital. With its wide tree-lined boulevards, French colonial architecture, peaceful lakes, and ancient oriental pagodas. 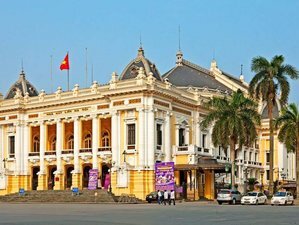 You will start at Hanoi’s key sites: the Ho Chi Minh Complex (Ho Chi Minh’s Mausoleum and stilt house), the Presidential Palace, the nearby One Pillar Pagoda; the Temple of Literature; West Lake including the sedate Tran Quoc Pagoda; and one of the city’s museums (a choice between the History Museum and the Ethnology Museum). You will end the day’s explorations and enjoy a traditional water puppet show. Overnight will still be in Hanoi. Breakfast and dinner will be provided for this day. The guide and the shuttle bus will pick you up at the hotel lobby at 8:00 to 8:20 a.m. and start your journey to the east of Halong Bay, through picturesque rice-farming villages of the Red River Delta, where you will see Vietnamese's everyday village life. On arrival, you will board on a beautiful traditional junk and spend a full day and night cruising the bay’s 3,000 magnificent limestone islets. In the evening, when the boat is anchored in the middle of the stunning lagoon, you will enjoy a wonderful seafood meal and later there is an opportunity for an evening swim from the side of the boat. You will spend the night on the luxurious boat. Breakfast, lunch, and dinner will be provided for this day. Awake early and participate in tai chi on the top deck or simply relax and enjoy the sunrise over the bay’s towering islands. Enjoy a morning cup of coffee or tea, before setting out to explore nearby islands by rowboat. Return to the junk for breakfast then take advantage of the sundeck and admire the amazing rock formations of Halong. You will have brunch on board the boat before returning to Halong pier to get back to Noi Bai International Airport (HAN) in Hanoi for a flight to Da Nang. Upon arrival, the driver will pick you up and transfer you to the hotel in Hoi An for check-in where you will stay overnight. Breakfast and lunch will be provided for this day. After breakfast, the guide will pick you up at the hotel then start a walking tour to explore the streets of Hoi An ancient town, visit the Japanese Covered Bridge, Phuc Kien Assembly Hall, and the 200-year old Tan Ky ancestral house, Chua Ong Pagoda. After lunch, you will take a short boat trip to a nearby island to visit a Thanh Ha handicraft village specializing in ceramics and tiles. Then after that, you will return to the hotel in the late afternoon and enjoy a free evening at your leisure. Overnight stay will be in Hoi An. Breakfast and lunch will be provided for this day. After breakfast, you will transfer to the airport for flight to Ho Chi Minh. Upon arrival to Ho Chi Minh, you will be welcomed by the tour guide or driver and transfer you to the hotel. At 1:00 p.m, the guide will pick you up at the hotel and take a short sight-seeing: the Reunification, visit Notre Dame Cathedral, the Central Post Office, and the War Remnants Museum. The rest of the day is free for shopping at Ben Thanh Market. Overnight will be in Ho Chi Minh. Breakfast is provided for this day. After breakfast, your guide and driver will pick you up at 8:00 a.m. to visit one of the most visited regions of the Mekong Delta, you will visit Cai Be floating market, cruising among the local barges stuffed-full of fruits and vegetables. Visit some local workshops then enjoy a delicious lunch served at a local house in the cool shade of An Binh Island’s orchards. In the afternoon, take a traditional rowboat and venture deeper into the countryside, floating through narrow canals to enjoy the peaceful surroundings. Stop at a nursery garden to discover how farmers along the delta produce their world famous fruits and vegetables. The cruise ends in Vinh Long. You will get on the bus and drive back to Ho Chi Minh. Breakfast and lunch are provided for this day. Free at leisure until transfer to Tan Son Nhat International Airport (SGN) for a flight back home. And that will be the end of your tour. This tour in Vietnam will mainly take place at Hanoi, Halong Bay, Hoi An, Ho Chi Minh, and Mekong Delta. Meals are provided for you as mentioned in the itinerary. You will also be given daily two bottled drinking water. Meals that will be served are a fusion of local Vietnam food or Indian food or Western food or Halal food (Muslim’s type) with daily normal breakfast. You should advise any special food preferences, allergies or dietary requirements at least one week prior to the arrival date.